Isla Mujeres is a Mexican island in the Caribbean Sea, nearby Cancún. It's a vacation destination known for beaches such as northern Playa Norte, resort hotels as well as for snorkeling and scuba diving on the surrounding coral reefs. The design boutique hotel „Icaco Island Village“ is a small, unique and also very private luxury island accommodation. It‘s located quite in the middle of the island with a pretty short walk to the center and right at the coast of the Caribbean sea. It only took us a few minutes drive from the ferry where we arrived on our first evening. It was already pretty late, but Matthew & Mattia were waiting for us at the reception and welcomed us very friendly. The whole check-in went super easy and comfortable so both, Matthew and Mattia could accompany us to our king suite soon after our arrival. They wanted to give us some time to rest and relax after a long day of traveling and would give us all the information about the island and the hotel on the next morning. The suite was designed in a minimalistic way. Light colors combined with dark wooden parts and beach accessories like rattan baskets or sea shells which caused a cozy feeling. It made you feel at home immediately. The highlight of our room was the king sized bed located in the middle of the room. The special part about it was the wall only consisting of windows enabling you the beautiful sight over the Caribbean sea right after waking up. From there we enjoyed the sound of the waves and the sea with a glass of chilled sparkling wine. 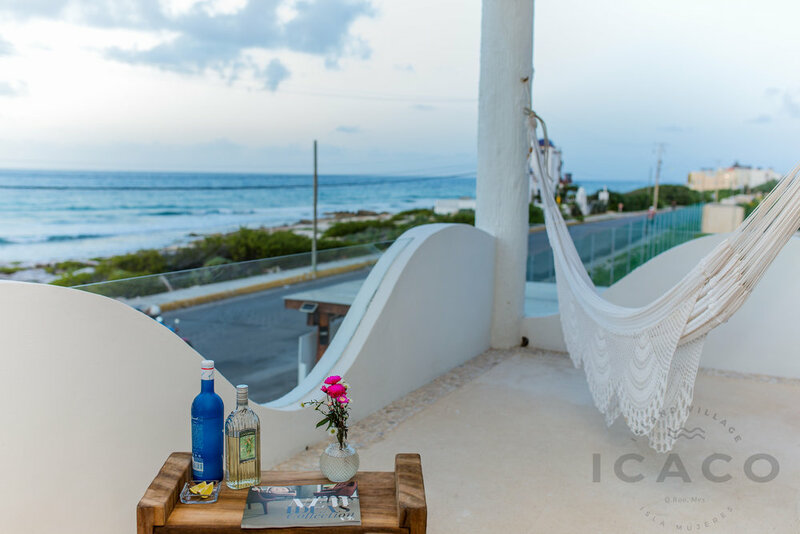 For all those having not enough of the views, there is the rooftop area providing a jacuzzi, a grill and several seats or sun beds for enjoying a nice & sunny day in privacy. 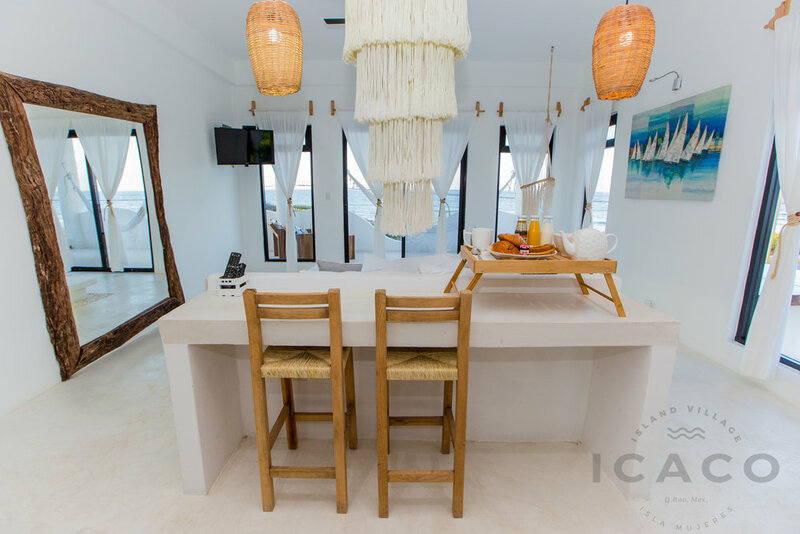 The four rooms are designed in light colors, decorated with seashells as the shower heads, white stone walls and wooden parts which match perfectly. The whole ambiance is comfortable and makes you immediately want to lay down in the hammock on the balcony. In the middle of our King suite was a king sized bed for two persons but three-person bedrooms are also available. The small kitchen in the back enables you to cook some coffee/tea for breakfast added to the prepared breakfast in bed you can expect at approximately 9 to 10 o‘clock in the morning. It consists of freshly cut fruits, delicious pressed juices, and local pastries. While the selection varies every day, we always found something we liked. Whenever you feel like going out, having a nice meal or just discovering the best parts of the island, Matthew and Mattia had amazing recommendations especially when it comes to restaurants and beach clubs. Even though we had high expectations we‘ve never been disappointed. On top of that, you partially get discounts for some really nice beach clubs or restaurants. Although we‘ve been wakened up by hardest rain, our first day turned out to get very pretty. After getting a map and recommendations we made our way to the downtown area of Isla Mujeres. Markets with seashells and souvenirs on every corner. Many authentic Mexican restaurants but also some variety in case you crave something different after quite a time in Mexico. We spent the afternoon at northern Playa Norte, number 10 of the most beautiful beaches in the world. Even though it was quite cloudy, the ice-cold cocktails in the beach club green demon tasted amazing and 28 degrees Celsius felt perfect in the shadow. Due to one of Matthew‘s recommendations, we went to the restaurant Lola Valentina for dinner. Our next day started sunny and nice so we rented a motorbike and planned on discovering the southeastern part of the island. The living area with many restaurants, fruit stands, and small markets for seashells is very nice to drive through. Especially when it comes to the beautiful homes right next to the beach. We visited a turtle farm and had a look at the ruins of a Mayan temple. When the rain wouldn’t stop anymore, we just decided to get an early dinner at the beach club: Raw Bar & Grill Mar Bella, where we got 10% off because of staying at Icaco Island Village. They provided this huge selection of fresh fish and any kind of seafood from lobster to scallops. Always just the fresh catch of the day. This was already our last night here on Isla Mujeres. I can warmly recommed this chic and cozy place for all travelers seeking for a boutique property rather than a huge resort. Lukas and Nina were guests of Icaco Island Village and were hosted by the owner Matthew & Mattia in return for above mentioned. However all opinions are their owns and have not been influenced.